The NHS is in crisis, while presented as ‘business as usual’ the involvement of companies such as Virgin Care in the NHS strikes us as daylight robbery. Branson’s Virgin Group pay no corporation tax in the UK. They have however been awarded over 400 NHS contracts, worth over 2 billion pounds. The NHS Anti-Swindle Team refuse to believe that your entitlement to healthcare should be dictated by the size of your bank balance, so rather than being alienated and powerless, let’s remember who it really belongs to and that nothing is irreversible. We are the majority and we will fight for the renationalisation of our health service. The NHS Anti Swindle Team want you to dress as a NHS robber, costumes will be provided for those who don’t own a stripy black and white top! Read more about us here: www.nhsantiswindle.co.uk. / @ – info@nhsantiswindle.co.uk. NHS Anti-Swindle Team will be supporting Docs not Cops #PatientsNotPassports bloc to fight for the NHS to be “FREE, FOR ALL, FOREVER”. Britain’s National Health Service, widely regarded as one of the finest public healthcare systems in the world, is under attack. The Conservative government has driven the NHS to the edge of ruin through chronic underfunding and repeated spending cuts. This is all part of a broader privatisation agenda designed to undermine public faith in state institutions, so they can be replaced with private sector alternatives. WHERE – Dalston Boys Club – 68 Boleyn Rd, London N16 8JG. ACCESS – Dalston Boys Club has ramp access. Unfortunately the toilets aren’t accessible but we have arranged access in the building next door where assistance will be on hand. 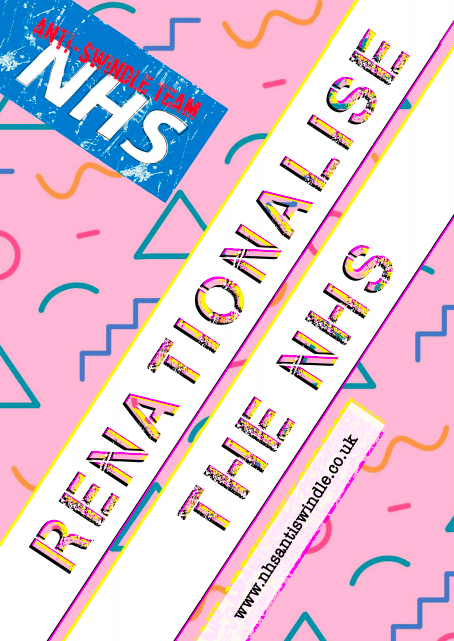 Thursday July 5th – 2018 Join the NHS Anti-Swindle Team and celebrate the NHS at it’s 70th birthday party – Venue / Time tbc. On July 5th, 2018 the NHS will be 70 years old. We plan to celebrate its anniversary, by creating a series of creative ‘Actions’ that will expose what the Government is doing, and push back against privatization!